For all of you hip hop music and rap music lovers, we created a new ringtone 2015 app, Hip Hop Ringtones Free so you can have them as your mobile ringtones free and at any time! Download the best, latest ringtones with crazy hip hop music and rap music beats. Fans of hip hop music always like to hear a good beat wherever they are and that cheers them up. This is why you should get Best Hip Hop Ringtones for Mobile. 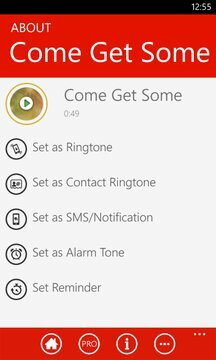 This free ringtone 2015 app contains best free music ringtones for your cell phones with cool sound effects to go with them. Surely, you can find a great use for your new MP3 ringtones – use your latest hip hop mobile ringtones as contact ringtones, SMS ringtones or notification sounds. All of you in search for the best, new MP3 ringtones with hip hop or rap music content are going to simply love Hip Hop Ringtones Free. 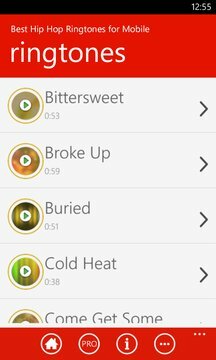 More than 30 of best ringtones with sick hip hop beats have been hand-picked for true lovers of new hip hop music. Best MP3 mobile ringtones with the latest, best ringtones 2015 are waiting for a phone call on your mobile phone to take the stage and become the center of attention. Rap ringtones and hip hop ringtones in your mobile phone carry an enormous amount of positive energy. Share that energy with everyone in your environment. Download the latest, new rap ringtones for your mobile phone and enjoy the endless positive energy these mobile ringtones provide! New hip hop music ringtones 2015 are here! Download Best Hip Hop Ringtones for Mobile. This application has been tested on the following phones (Windows Phone 8, Windows Phone 8.1): Nokia Lumia 625, Nokia Lumia 925, Nokia Lumia 1520, Nokia Lumia 820, Nokia Lumia 525, Nokia Lumia 1320, HTC 8X, HTC 8S, HTC One M8, Nokia Lumia 520, Nokia Lumia 720, Nokia Lumia 1020, Nokia Lumia 521, Samsung Ativ S, Nokia Lumia 510, Nokia Lumia 928, Nokia Lumia Icon, Nokia Lumia 822, Nokia Lumia 810, HTC 8XT, Huawei Ascend W1, Huawei Ascend W2. Compatible with Verizon, AT&T and all other providers. Sound clips used in Best Hip Hop Ringtones for Mobile Windows app are under public domain license and/or Creative Commons’ license.